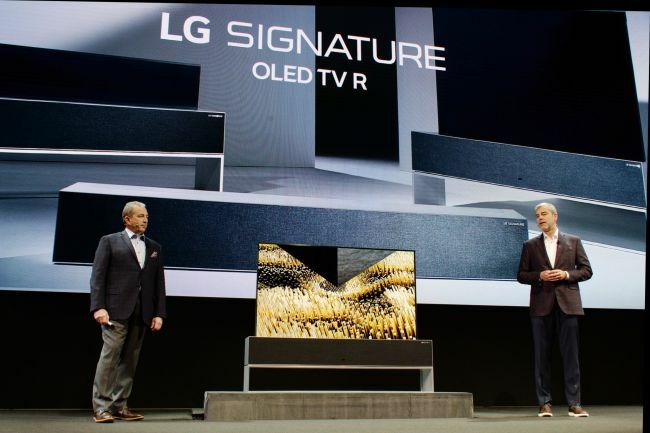 LAS VEGAS -- Hearty cheers and camera flashes filled the venue of LG Electronics’ press conference as the tech giant’s 65-inch OLED TV screen gracefully slid down into a sound speaker box. It is a television that one has never seen before. A day before the opening of the Consumer Electronics Show 2019, LG Electronics unveiled the world’s first rollable organic light-emitting diode TV, with a plan to commercialize it in the second half of the year. The Korean TV maker presented its 65-inch LG Signature OLED TV R to the global press in what is going to be the industry’s first commercial flexible OLED display TV. The “R” in the name stands for revolutionary, rollable and redefinition of the space, according to the company. Despite being described as “rollable,” the TV does not roll up but rather folds up like a blind. It comes with a rectangular sound speaker where the TV can be hidden when it is not in use. The TV does not have to be attached to a wall. Due to the absence of backlights in the self-emissive OLED panel, the rollable TV is as thin as normal OLED TVs. But due to its caterpillar structure, the rollable screen is thicker than the 4-milimeter Wallpaper TV, according to LG. The company declined to reveal an accurate figure for thickness. The rollable TV provides three view types: Full View when the 65-inch screen entirely unfolds, Line View when only some part of the screen is shown, and Zero View when the screen is hidden. Line View offers five modes, using the screen as a versatile platform. The modes are music, clock, frame, mood and home dashboard. The frame mode displays pictures from a user’s smartphone, while the home dashboard mode controls smart devices connected with the TV. LG plans to roll out the new model globally starting with the Korean market in the second half of the year, the company said. “We will show what is a true evolution of displays with the world’s first rollable OLED TV,” said Kwon Bong-seok, president of LG’s home entertainment and mobile communications businesses. The rollable TV is ready for launch in just one year since its main panel provider LG Display first introduced the panel at the CES 2018. At another press conference hosted by LG Display, its Vice Chairman and CEO Han Sang-beom showed confidence in the durability of the rollable OLED panel. The panel maker is in talks with some of its 15 OLED customers other than LG Electronics to supply the rollable panel, the vice chairman said. Demand for the rollable display could be created in the automotive industry, Han said. For example, the company is developing a panel that can be rolled up like a poster and is to be hung on the ceiling of a vehicle, so that it can be rolled out when needed for passengers in the backseat.